Please doubleclick the image to enlarge. Please doubleclick the following hyperlink to read a very interesting article by Liam McDougall, Home Affairs Editor, Sunday Herald. This article appeared on November 12, 2006. According to this article, the trial and conviction of Megrahi was a total fraud perpetrated by the CIA and the FBI. On July 17, 2006, ten years will have passed since TWA 800 crashed off Long Island. The conclusion of the NTSB was that there had been an explosion in the central fuel tank. It was recommended that all airlines introduce nitrogen into fuel tanks to stop future catastrophes from occurring. Since none of these recommendations have been implemented, one can only conclude (1) the NTSB has been placing the flying public at risk; or (2) that they were lying in the first place! June 12, 2006. "The United States government has suddenly removed Libya from their list of "countries supporting terrorism". For more details, please to the LOCKERBIE 2006 webpage. Please see Lockerbie 2006 for the latest information on Pan Am 103. May 5, 2006. Air India 182 update. Story from BBC News, 2006/05/02. Canadian Prime Minister Stephen Harper has launched an official inquiry into the bombing of an Air India passenger plane more than 20 years ago. January 27, 2006. The Lockerbie story is going to develop significantly in the first half of this year and, as such, I have created a new webpage - Lockerbie 2006. December 21, 2005. Seventeen years have passed since someone placed an IED on Pan Am 103 and caused it to crash over Lockerbie, Scotland. I am firmly convinced that the truth will come out in 2006 so I have created a new webpage called "Lockerbie 2006". I have located a Toshiba RT-SF 16 radio cassette. However, we will be willing to purchase up to two more of these models. 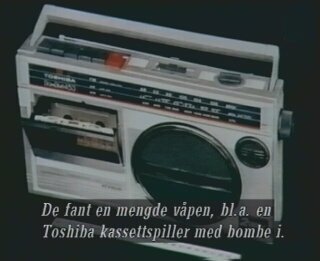 We are also seeking a Toshiba radio cassette "BomBeat" 453 as pictured below. November 18, 2005. You have to admire the courage, determination and tenacity of Dr. Jim Swire as he doggedly seeks the truth about what happened to Pan Am 103. On November 18, Dr. Swire and Eddie MacKechnie visited Megrahi in the Greenock Jail. I cannot comment on what was said during this meeting but it is important that you read what was said in the local Scottish newspapers. A LEADING figure in the group representing British victims of the Lockerbie bombing has met the man convicted of the bombing for the first time. Dr Jim Swire, 69, who lost his 24-year-old daughter Flora in the 1988 bombing, met Abdelbaset Ali Mohmed al Megrahi at Greenock Prison on Wednesday. The Gloucestershire-based leader of the campaign group UK Families Flight 103 (UKF103) does not believe the Libyan is responsible for the attack. Last night Dr Swire said the purpose of the meeting was to ask Megrahi whether he would still press for the Scottish Criminal Cases Review Commission (SCCRC) to continue its review of his case if rumours of his repatriation proved to be correct. "Megrahi was happy for me to make it known that he is determined to pursue a review of the case, no matter what might evolve concerning his future detention. "It is very important to the members of UKF103 campaign group that there be a full review of the entire Lockerbie scenario through an appropriately empowered and independent inquiry, but absence of a further review of the court case would also damage our search for truth and justice." Dr Swire said that even if Megrahi did not continue with his appeal bid, the campaign group would press the SCCRC to review the case as interested parties. There was much similar comment in Scotland. November 9, 2005. According to the following article, Lord Fraser appears to be reversing his opinion about the credibility of Malta shopkeeper, Tony Gauci. It is worth checking out the following link once again to remember that a Scottish police chief stated that the timer fragment was planted by the CIA. November 7, 2005. The British public should be horrified to learn that consideration is being given to returning Megrahi to Libya in exchange for Libya releasing 5 Bulgarians who are accused of spreading the HIV virus to 400 Libyan children. November 3. 2005. It is important to read the following article published in "The Scotsman" law pages on November 3, 2005, written by Jennifer Veitch, a freelance writer and journalist. Ms. Veitch interviewed Professor Robert Black who is furious that justice has not been achieved in the Lockerbie case and who claims this miscarriage of justice is seriously damaging the Scottish legal system. November 1, 2005. There appear to be some disturbing developments in the Lockerbie case. Consideration is being given to returning Abdelbaset Al Megrahi to Libya to serve out his 27-year sentence. In my opinion, if in fact he is guilty - and many of us seriously question this conclusion - why was he ever provided with a jail cell with an exercise room and a private kitchen? If the Scottish Court truly believe he was guilty of murdering 270 people, shouldn't he be breaking rocks in the Highlands of Scotland, with a ball and chain around his ankle? It is most probable that if he is returned to Libya he will be given his freedom. The Megrahi case needs to be resolved in Scotland before any further action is taken. At this time, an attempt is being made to drop the Lockerbie investigation currently being undertaken by the Scottish Criminal Cases Review Commission. Please read the following links to relevant articles in the Scottish and British press, together with responses by Dr.Jim Swire. October 23, 2005. It is also rumored that the seven Bulgarian nurses accused of spreading AIDS in Libya, who are at present under the threat of being hanged, may be sent back to Bulgaria "in exchange for" Bulgaria sending troops to Iraq. August 29, 2005. It is my understanding the the Scottish Criminal Cases Review Commission will not issue its findings on the Lockerbie case until Spring, 2006. August 19, 2005. President Bush sent Senator Richard Lugar to Libya in an attempt to normalize relationships between Libya and the US. July 17, 2005. "Lockerbie and the CIA". On July 17, 2005, SKY ONE TV aired a 1-hour documentary on the Lockerbie case. Unfortunately, this documentary was only seen in Europe and only by people with satellite communications. People familiar with the Lockerbie case were not impressed by this Redback Films production. However, I personally thought this film was well done in the sense that it introduced the subject to a public who may already have forgotten about Lockerbie. There were many important points which were omitted; however, there was sufficient evidence to question whether or not Libya was involved with the downing of Pan Am 103. Three important developments should be monitored in the next few months. (a) It is anticipated that the Scottish Criminal Cases Review Commission will announce its findings in September, 2005. It is also expected that this Commission will refer the Lockerbie case back to the Scottish Appeals Court. (b) Redback Films is in the process of making a film on Lockerbie, which will be aired on SKY ONE TV (U.K. and Europe) in August, 2005. (c) This fall, we can expect a comprehensive documentary on the Pan Am 103 disaster which will be aired on Channel 4 in the U.K.
Libya, after 7 extensions of the Lockerbie settlement agreement, withdrew 20% of the settlement money from the Bank for International Settlements. This action was based upon the fact that the U.S. State Department refuses to remove Libya from the list of states sponsoring terrorism. The Pan Am 103 victims' families have received a total of $8 million per victim. The two accused Sikhs who allegedly placed the bomb on Air India 182 have been found not guilty. The question becomes, "Who was responsible for this crime?" There are calls for a public inquiry, but this is very unlikely. January lst, 2005 - You can expect some significant developments in the Pan Am 103 case. According to my information, the Air India 182 case has been closed and a ruling by the court can be expected in March, 2005. December 21st, 2004 - 16 years ago, someone planted an IED on Pan Am 103, which brought down the aircraft over Lockerbie just after 7 p.m. There are a number of people who still believe the person or groups of individuals who were involved with this disaster have yet to be brought to justice. There have been significant developments which should be brought to fruition in 2005. After Megrahi has been relocated to Greenock Prison, I will post his new address on this website. October 8, 2004 - On the History Channel this day was an updated version of the TWA 800 investigation documentary. This documentary was extremely interesting for three main reasons: first, it mentioned three times that the nose of the plane came off first; secondly, it stressed that the conclusions by the NTSB were clearly questionable and I would certainly agree, as you can read in my book; thirdly, this documentary could have been extended for at least another hour or two as many of the erroneous conclusions had not been aired. Your comments would be welcomed. We are expecting a decision from the Scottish Criminal Cases Review Commission in the next few weeks. My sources tell me that proof that Mr. Megrahi was not involved in the destruction of Pan Am 103 is now conclusive. If this proves to be the case, the Commission will refer the findings back to the Appeals Court for further deliberation and, hopefully, this will lead to the release of Mr. Megrahi. If the new evidence proves to be accepted by the Court, then a new trial should not be necessary. I will make every effort to post the conclusions of the Court at this website. I would be willing to set up a blog at this website for any comments you may have. Please send comments to the above email address and I will build the blog. The U.S. draconian economic sanctions against Libya have been permanently lifted and the Libyan Government has paid an additional $4 million to each of the families of the Pan Am 103 victims. It was my understanding that a major article was to have been published in the German newspaper "Das Spiegel" towards the end of August. I expected this article to discuss a major investigation which has been conducted by the German BKA (the FBI equivalent in Germany). I expected it to have clearly demonstrated that Libya was not involved in the Pan Am 103 disaster over Lockerbie. The BKA has proof that the IED could not have been introduced into the airline baggage system in Malta. Furthermore, we should expect to have a detailed analysis of the "fragment" that was used to point to Libya as the perpetrator of the bombing of Pan Am 103. I now understand that the "Das Spiegel" article will be delayed until after the German elections. The Libyan Government has just paid out the sum of $35 million to the victims of the "La Belle" nightclub bombing. I, personally, do not believe the Libyan government was behind this terrible deed. "RIPPED FROM THE SKY" - On June 9th, 2004, at 8 p.m. CST in the U.S., on the National Geographic TV channel, there was an extremely interesting documentary. It reviewed the catastrophic events on United Airlines 811 (Boeing 747-122, N4713U, delivered in 1970) during the course of a flight from Honolulu to Auckland, New Zealand, on February 24th, 1989. According to the initial NTSB accident report, the ground crew was accused of not closing the cargo door correctly and damaging the locking device. This ultimately caused the cargo door on Flight UA 811 to separate from the fuselage, thus leading to an explosive decompression of the aircraft. At the same time, a large piece of Section 42 broke loose from the fuselage and 9 passengers lost their lives when they were sucked out of the aircraft. Kevin and Susan Campbell, who lost their son Lee on this flight, did not agree with the original NTSB accident report and embarked on a personal, 2-year investigation of the accident. The results of their investigation led, in 1991, to the NTSB reluctantly changing its conclusions. It was finally concluded that there were two main problems with the cargo door on these Boeing 747 100's. The aluminum locks were not strong enough and it had been recommended that they be replaced with steel locking devices. A second problem with the cargo door resulted from a badly designed electrical control system which caused the locks to be released in flight. There are definite similarities between the United Airlines 811 accident, TWA 800 accident and Pan Am 103 accident. Could it have been that Section 42 separating from the fuselage was actually the initial failing event? 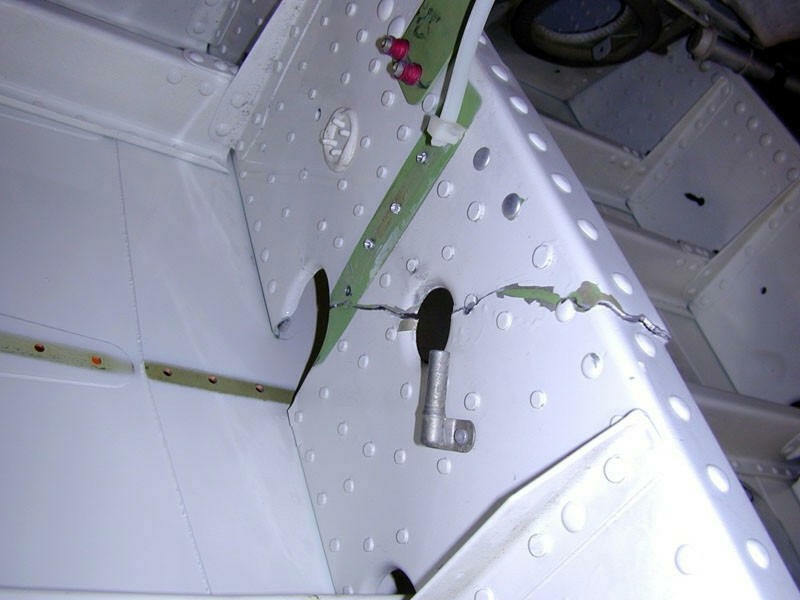 Could it have been that metal fatigue was occurring in Section 42, causing an electrical short that in turn caused the cargo door locking device to open? Why would a large section of Section 42 separate from the fuselage when the cargo door was blown off? With the cargo door removed, the pressure differential across Section 42 would have been reduced, not increased. April 23, 2004. According to CNN today, President Bush has permanently lifted the economic sanctions imposed on the 5 million Libyans! March 23, 2004. 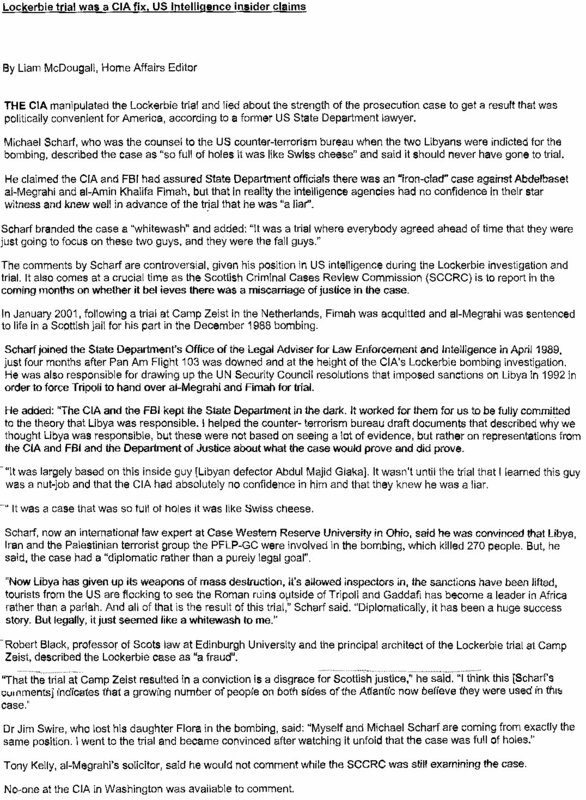 "LOCKERBIE FATHER FEARS JAILED MAN IS INNOCENT" - This headline appeared in the March 15, 2004 edition of the London based newspaper " The Guardian". Dr. Jim Swire, whose daughter, Flora, was killed in the Pan Am 103 disaster, now believes that Abdel Baset al Megrahi is innocent of this crime. To read the complete newspaper article, please visit the Guardian website. ** I have received the following important email letter from a European aircraft structure specialist whose name I have agreed not to post on this website. 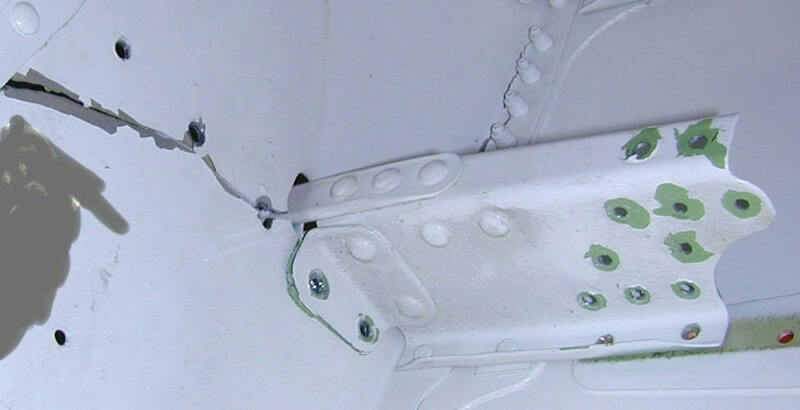 Included, following the email letter, are three very important photos of Section 41 fatigue cracks that occurred on a Boeing 747-100 aircraft. On January 29, 2004, at 8 p.m. EST the History Channel aired a very important TV documentary entitled "ENGINEERING DISASTERS". During the program, there was a very interesting discussion about aluminum metal fatigue in aircraft. This problem has been well known in the commercial airline business for over 30 years. According to this documentary, many airline companies have not been repairing known problems in a timely manner. The documentary provides supporting data to my theory that metal fatigue was part of the problem which led to the break-up and subsequent crash of several Boeing 747-100's. Please double-click the following hyperlink to view a video from this documentary. 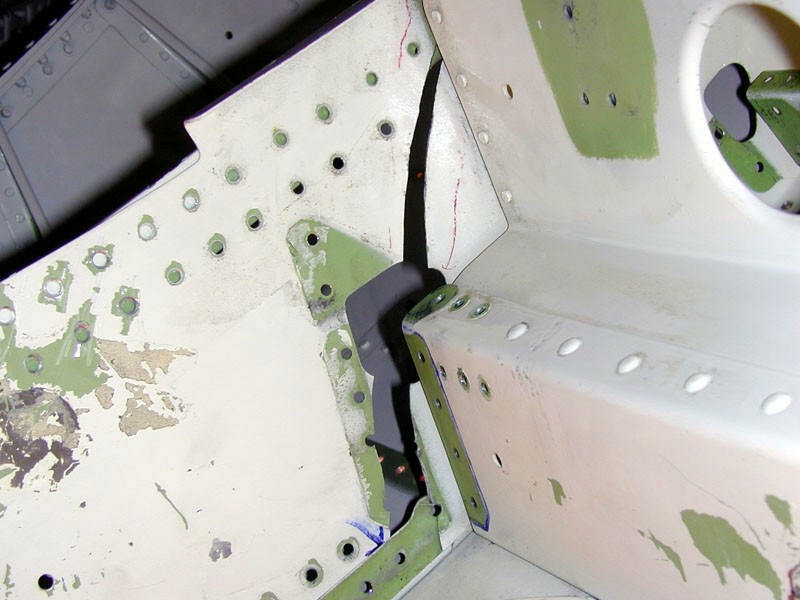 It confirms the problems that airline companies have had with aluminum metal fatigue. This problem is even more serious when the quality of the aluminum parts is sub-standard, as was the case in Pan Am 103. In this documentary, it is mentioned that serious fatigue problems occur after 30 - 50,000 take-offs and landings. In the case of the Boeing 747, these fatigue problems were occurring before 10,000 cycles. The following videoclip is very large and may take some time to download unless you have a high-speed internet service. 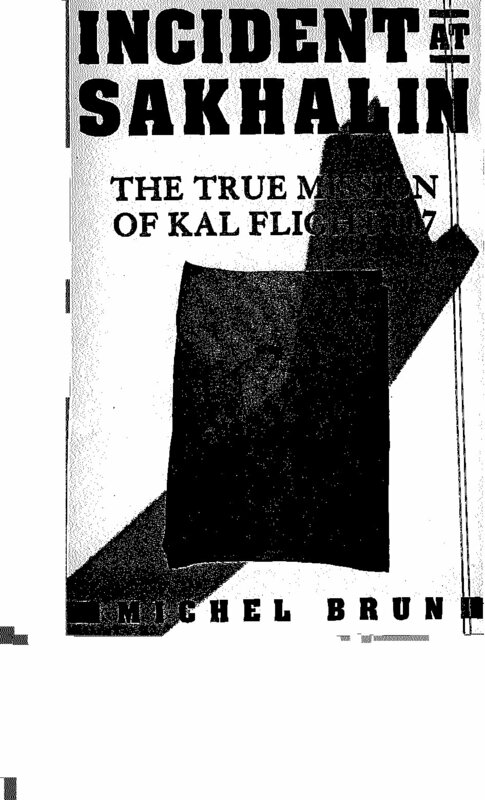 Michel Brun, an aircraft accident investigator, wrote a book entitled "INCIDENT AT SAKHALIN". 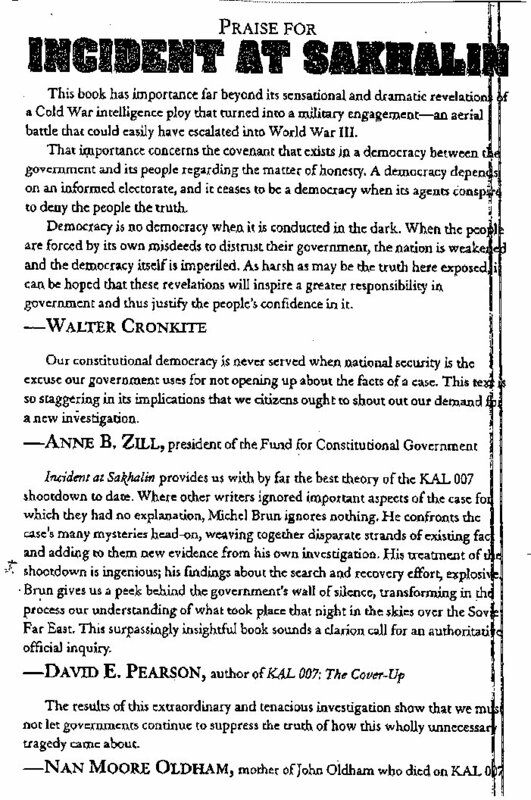 On the back cover of this book, there is a quote by Walter Cronkite which I believe is very important when one is considering whether or not an independent inquiry should be undertaken in the case of Pan Am 103. Please see below for the front and back cover pages. Please doubleclick these images to see full size. February 27, 2004. The U.S. government lifted the economic sanctions against Libya. Hopefully, this action will lead to normal relationships between Libya and the rest of the world. The quest for the truth in the Lockerbie case continues. February 17, 2004. The PBS TV channel aired a documentary, in the NOVA series, about the crash of Swissair 111 on September 2, 1998. According to this documentary, this plane was brought down by a fire caused by an electrical short above the cockpit. At the end of the documentary, a reporter states that nothing has been done to resolve these electrical problems in the thousands of aircraft that are flying today. This documentary came to completely different conclusions from a documentary on the same subject which was produced by a German/Swiss team. You can read details of these differences in my book. February 1, 2004. I have just learnt that Mr. Peter Biddulph and Dr. Jim Swire are withholding publication of their new book pending certain developments in the investigation of the Pan Am 103 disaster. Their book will be entitled "Lockerbie ... In search of the truth". I have been authorized by them to present the following questions about the evidence against Mr. Megrahi and the Libyan government on my website. These questions need to be answered by an independent inquiry. WHY was one of the bombs stolen and by whom one day before Khreesat's arrest in October 1988? Was this the bomb that destroyed Pan Am 103? Why for more than a year did the head of the FBI's Lockerbie investigation team believe that to be true? WHY did the former President of Iran admit - on camera in 1993 - that only three weeks after Lockerbie Iran paid the Jibril group $11m? January 22, 2004. On January 9th, 2004, the Libyan and French governments settled on a compensation package for the victims of the 1989 bombing of UTA 772 over Niger. The settlement was for $1 million per victim. The Libyans agreed to pay but did not admit to having supported state-sponsored terrorism. Why did the French government accept such a low compensation package for the French victims when the Libyan government has agreed to pay the Pan Am 103 victims' families $10 million per victim. Furthermore, it is also interesting to note that TWA and Boeing paid $2.7 million per victim for the crash of TWA 800. Are some people more valuable than others? If you have any thoughts on these matters, I would be willing to post them on this website. In recent days, the government of Libya has offered both the U.S. and the U.K. the opportunity to inspect the entire country for weapons of mass destruction. Despite this overture on behalf of the Libyan government, the U.S. today extended the economic sanctions against Libya for a further 180 days. The Megrahi defense team is moving ahead with the request to have the Scottish courts re-visit its decision to accuse Megrahi of bombing Pan Am 103. According to these lawyers, "there appears to be a gross miscarriage of justice." December 21, 2003. The U.S. and the U.K. governments have just made an agreement with the Libyan government to remove all weapons of mass destruction from Libyan soil. On November 17, 2003, three Scottish judges pronounced that Abelbaset al Megrahi will spend 27 years incarcerated in the Scottish jail. This pronouncement is in accordance with the European Commission on Human Rights legislation. Previously, in Scottish law, sentences were committed by politicians but under the new rules this obligation rests with the judges. Meanwhile, the Megrahi lawyers are moving ahead with the effort to prove that Megrahi is innocent of the Lockerbie crime. Megrahi is scheduled to be released in 2026. However, some of the victims' families have voiced strong opposition to him ever being released from jail. I have been contacted by an investigator who has been studying the two crashes of the DeHavilland Comet in the 1950's. This story is so important, I have created a new webpage "Comet Inquiry". Please click the button above. This week, the lawyer representing Abdelbaset al Megrahi, Edward MacKechnie, QC, will lodge an Application to the Scottish Criminal Cases Review Commission in an attempt to obtain a new trial for Mr. Megrahi. The United Nations sanctions against Libya were lifted permanently today. The sanctions imposed by the United States remain in effect. Some very important speeches were delivered at the United Nations. These can be read on the United Nations website. According to my sources and news releases, the Libyan government has presented a document to the United Nations offering the victims' families $4 million for each victim once the U.N. sanctions have been permanently lifted. The Libyan government has requested that the U.S. sanctions be permanently lifted, at which time it will issue a further $4 million to the victims' families and a further $2 million once the U.S. has removed Libya from its list of states sponsoring terrorism. The French government has vowed to veto the removal of the U.N. sanctions until the families of the victims who were lost in the crash of UTA 722 over Niger are paid similar amounts. A number of the British families are still insisting upon an independent inquiry into the Lockerbie case and many of the American victims' families are going to block the lifting of U.S. sanctions until a number of the Libyan authorities are brought to trial. Pan Am 103 - the Lockerbie case. If you thought the Lockerbie case was over when Megrahi was jailed in Glasgow, you were quite wrong. Mr. Eddie MacKechnie, Q.C. will be filing the appropriate documentation to the Scottish Criminal Cases Review Commision (SCCRC) before the end of August, 2003. My sources tell me that the Libyan government has placed $2.7 billion in four Swiss clearing banks, to be paid to the families of the victims of the Pan Am 103 disaster. It has just been announced that Libya will pay an initial amount of $5 million for each victim killed at Lockerbie and will agree to accept responsibility for the crash of Pan Am 103. The Libyan government will be sending documentation to the United Nations which will allow the U.N. to permanently lift the economic sanctions against Libya. It is unclear when the U.S. will lift the economic sanctions against Libya but it is expected to be before April of 2004. At the time that the U.S. sanctions are lifted, Libya will release a further $5 million to each of the victims' families. According to my sources, the Libyan government has also stated that it will continue to seek the truth behind the Lockerbie case and will do everything in its power to have Megrahi exonerated and returned to Libya. The Libyan government is confident that the truth will be forthcoming. August 13, 2003, Dan Rather, CBS Evening News. Dan Rather announced the Lockerbie settlement on CBS evening news. He concluded his report by stating that it was still unclear whether or not Iran was implicated in the Lockerbie disaster. Dan Rather knows the truth! August 14, 2003. BBC World News. During the announcement of the Lockerbie settlement, it was stated that the money for the payments to the victims' families was coming from Libyan businessmen, and that under the settlement nobody in the Libyan government was being held personally responsible for the Lockerbie disaster. A British spokesman for the victims' families stated that they were still disturbed by the fact that an independent inquiry into the Lockerbie disaster was not being undertaken and many questions that the families have remain unanswered. Air India 182. The trial continues in Vancouver, British Columbia, Canada. The prosecution has been experiencing some enormous difficulties and the defense team has been trying to take advantage of the fact that the RCMP destroyed a very large amount of data pertaining to the investigation. "After several years of investigation by the National Transportation Safety Board, it was decided that TWA 800 was brought down by an explosion in the central fuel tank. It was recommended at the time that all commercial planes should be equipped with a system to inject nitrogen into the fuel tanks as they were being depleted during flight. In my investigation, no commercial planes for the previous 50 years or the 7 years after the TWA 800 crash have experienced such an explosion. One has to ask oneself why have the authorities not insisted on a nitrogen purge system for all commercial planes? Could it be that they know that such an explosion is impossible? Or are the authorities not informing the public of this risk? And why do pilots continue to operate these planes in what is said to be a dangerous condition? As a chemical/petroleum engineer, I can assure you that such an explosion did not occur." China Air 611. The initial investigation of the China Air 611 crash has been completed - the results are available on the internet. The official investigators have been very forthcoming and have issued an interesting report wherein all of the most obvious reasons for the crash are eliminated. A final report is not due until the Fall of 2004. Although I have repeatedly requested that the investigators conduct certain metallurgical tests on the structure around Section 41, my recommendations were not taken into consideration. The crash of China Air 611 bears an extraordinary resemblance to the crash of Air India 182, which was an identical airplane. February 11, 2003. There has been a very important development in the Air India 182 case in Vancouver, Canada. One of the accused, Inderjit Singh Reyat, has made a deal with the Crown. For details, click below and read articles in the Toronto Globe & Mail, February 11, 2003. In search mode, under Air India 182, you will find several interesting articles. According to my sources in Vancouver, I quote, "The crown made him an offer that he could not refuse. He accepted a deal that will allow him to go home before the trial is scheduled to end and probably even before the trial commences. He has also not admitted to making a bomb, any bomb, or even knowing anything about the bomb that took down the plane." Mr. Reyat received a very light sentence based upon the fact that there is inconclusive evidence to convict him of mass murder. January 20, 2003. An extraordinary event! The U.N. Human Rights Commission today elected Libya's ambassador, Najat al Hajjiji, its new chairwoman, inflicting a setback for the United States which had strongly opposed the North African nation. This could have a significant impact on finding the truth behind the Lockerbie catastrophe. October, 2002. Interestingly enough, a documentary on Lockerbie was shown on German TV ARD in their "Wochenruckblick" program. The program cited Palestinian Chalid Awad as saying that Abu Nidal and the terrorist organization, PFLP, headed by Ahmed Jibril, had been paid to place a bomb on Pan Am 103. This is not news. You can read details of this in my book. We are going to try and find out the basis of this claim and if the authors of the documentary have any new evidence. The new Lockerbie defense team, headed by Mr. Edward MacKechnie, QC, filed a petition challenging that the human rights of Mr. Abdelbaset al-Megrahi had been violated by the UK government. These papers were filed in Strasbourg at the European Commission for Human Rights on September 11, 2002. Even if it is determined that Mr. Megrahi's human rights were violated, he will not necessarily be released from jail. On August 21, 2002 there was a documentary called "LOCKERBIE" in the "Minute by Minute" series on the Arts & Entertainment TV Channel in the United States. This documentary was a chronic distortion of the facts and I challenged the authors via email. They replied saying they stood by the facts in their documentary. I challenged them once again, and was ignored. "The crown has conceded unacceptable negligence in the police destroying the wiretap that would show the innocence of the accused. This is the start of the Crown's worries. The case is full of perils for the Crown and it is doubtful if the trial will start as scheduled next year - there are just too many issues that need to be resolved before the trial can commence. As an example, one issue is the involvement of the Government of India in this tragedy. The defense had requested disclosure in the possession of the CSIS and have not received any meaningful response for months. It is likely that the CSIS will refuse to provide disclosure and it may be that litigating this disclosure may take many months. Another issue is the missing black box that the government of India has refused to provide since November of 2001. Yet another issue is the expert report on the location of the bomb in the plane. This is outstanding since November of 2001 as well. (The rumor is that the report supports the defense and that is the reason for the delay)." August, 2002. *China Air 611. Detailed information about the cause of the crash of China Air 611 is becoming available through the Taiwan Government's Aviation Safety Council. My detailed enquiries have received a very rapid response. Details will now be found on the China Air 611 webpage above. *Jihad Jibril killed. On May 21, 2002 Jihad Jibril was killed by a car bomb in Beirut, Lebanon. His father, Ahmed Jibril heads up the PFLP. You can read about Ahmed Jibril in my book. Details of Ahmed Jibril's involvement in the Pan Am 103 crash are available in a documentary called "The Maltese Double Cross". Unfortunately, this documentary is banned from being shown in the UK and USA. *Megrahi's new legal counsel. Megrahi has engaged new legal counsel, Mr. Edward MacKechnie, QC. It was Mr. MacKechnie who successfully argued that Fhimah was not involved in placing a bomb on Pan Am 103. On April 20, 2002, I received a letter from Mr. Megrahi, written in very neat and educated Libyan Arabic. A Lebanese neighbor of mine has translated his letter and she told me that Mr. Megrahi must be a very educated man to write so well in his native language. I received your letter and I was happy for that. Thank you for sending your book on the sad Lockerbie event. May I point out to you that my name that appears on page five in your book is spelled wrongly. My name is Abdel Baset not Abdel Basser. Sorry for pointing this out. Dear people, thank you for your feelings and concerns for me. I would like to take the opportunity to ask how can one be indicted over a crime, without anyone hearing his plea or hearing anyone in his defense? What Justice! I was hoping for a just court case. But Hope was lost and Justice was absent. When I relate this story to you I am referring to history and what suffering this man went through due to a cruel and wrong judgment. This is the story of one, Mr. Laurence Jones – a black teacher and preacher. He was condemned to death for inciting the black people of this church to carry guns. As he was preaching in church a group of white men heard him say, “Life is a struggle. Every black man must struggle with his arms and fight in order to earn a living and succeed.” This was enough to kill him. So they dragged him a mile away and then decided to hang him and then burn his body. One of the crowd suggested that they should let him speak first. He related the effort that he went through to teach these young men to read, to be mechanics or to have knowledge of agriculture. He mentioned the names of all the white men that had helped him achieve his goal. How they helped him financially too. Dear Davies, dear friends; Give me a chance and hear me, and if they do not believe in my innocence, let them hang me. Because a Person that kills deserves to be killed. Allow me a chance to answer. I am a father of Five Children. I love my children and hate no-one. A person that does not hate cannot kill anyone. (Written in English) DEAR CARL A. DAVIES. I HOPE YOU WILL FIND SOMEBODY WHO WILL TRANSLATE THE ABOVE PROPERLY. Thank you. All the best. Please review the Free Megrahi! webpage on this website. In January, 2002, the U.S. State Department told the owners of American oil companies in Libya - Occidental Petroleum and Oasis Oil Company - (I worked for Oasis from l968 to l973) - that they are now authorized to renegotiate their oil concessions in Libya. The Libyan/Iran Sanction Act is otherwise still in force. A very good friend of mine in Morges, Switzerland, brought to my attention the fact that Radio 74 in Geneva, Switzerland, recently broadcast an expose on TWA 800 based upon documents provided by Commander William Donaldson and James Sander, who has written two books on TWA 800. The details in this expose were shocking, to say the least. These two gentlemen, together with several hundred eyewitnesses, claim that TWA 800 was brought down by a missile. As you will see from this web site, I believe the problem was the breakup of Section 41 on this aircraft. One thing that we certainly agree upon is that the official version of the TWA 800 disaster was woefully inaccurate and could constitute a serious cover-up. TWA 800 was most certainly not brought down by an explosion in the central fuel tank. It is a shame that the Americans and British cannot hear this expose on their radios. On April 18, 19 and 28th, 2002, at 6 p.m. I was interviewed for three 45-minute sessions on Radio 74, Geneva, to discuss my book and my investigation. Since then, Ginna Lewis, host of "Freely speaking" on Radio 74, has aired two other sessions. She was reading from the U.K. publication, "Private Eye" (issue May/June, 2001) which produced a 32-page review of the Pan Am 103 disaster, and maintains that Megrahi is innocent. I was totally shocked and stunned over the attack on the World Trade Center and the Pentagon on September 11, 2001. This wanton disregard for human life must leave the whole world in a state of shock. I have worked for the last five years to do my part in demonstrating that Libyan Arabs were not involved in the Pan Am 103 disaster. There are literally dozens of non-Arab investigators and reporters who do not agree with the conclusion of the trial wherein Megrahi was convicted of bombing Pan Am 103. I can only hope that the world will remain rational as it seeks justice for the criminal activity that occurred on American soil. 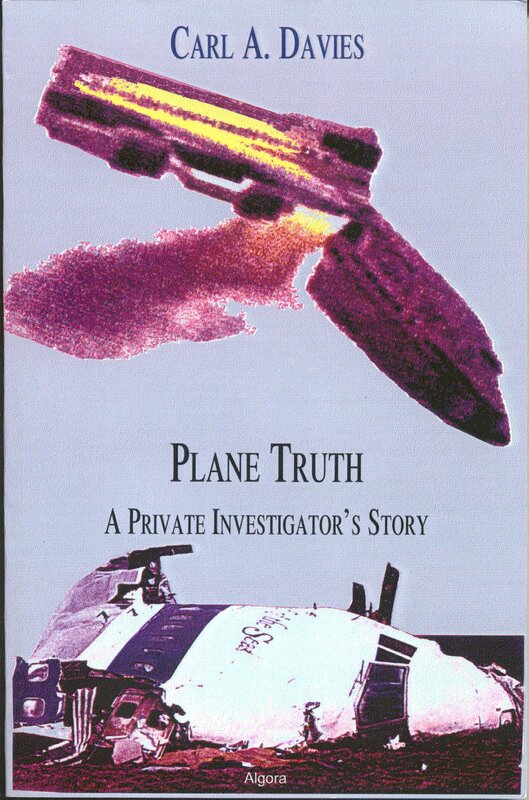 In the original manuscript for my book, "Plane Truth", written in 1999, which was submitted and accepted by Algora Publishing of New York, I had included a Chapter 15 which was entitled, "Inviting Terrorism" in which I predicted that world events could lead to random acts of terrorism, even against the United States. Unfortunately, my publisher chose not to include this chapter in the published book. However, following the September 11 disaster in New York, I feel that this chapter would have been an important addition to my book. For your information, I have included it in this web site. Please click "Terrorism" above. This website is designed primarily to supplement my book. It is a story as well as an investigation. The story includes a discussion of the first commercial jet airliner (1949-1950) - the de Havilland Comet. Two of these Comets crashed due to metal fatigue / failure. My father was one of the aircraft inspectors / crash investigators at that time. My book tells a different story and arrives at different conclusions from the ones you may have read or seen as broadcast by the mass media. It is a story based on a personal investigation. The final outcome of the Pan Am 103 trial did not consider all of the facts. Many of these facts could have drastically changed the outcome of the Lockerbie trial. I do not subscribe to conspiracy theories. All of my information is from reliable sources and supported by well-documented facts. This website will be enhanced periodically to offer those with inquiring minds the opportunity to investigate these crashes in far more detail than has ever been open and available to the public worldwide. Did any of the investigators in the Pan Am 103 case look into any similarities between Pan Am 103, TWA 800, Air India 182 and other Boeing 747 accidents? I did. They did not. Carl A. Davies -- professional engineer, pilot and investigative reporter. Amazon.co.uk also offers the book. Amazon.com can provide copies outside the USA in the meantime. For comments on my book see http://www.algora.com and http://www.bn.com. I encourage you to add your comments and opinions. B & N has a list of the book chapters, which is neat and informative. This website was started on December 22, 2000. Come back for more supporting documentation. Come back often. I will bring more and more data as time permits.